Raccoon Tales by Joy Dekok – Review and Giveaway! Raccoon Tales by Joy DeKok is a charming, rhyming story of a year in the life of five orphaned raccoons. Taken in by a man and woman, this tells the story of how Chatter, Lucy, Shadow, Meeko, and RC were rescued, cared for, nursed when ill, and finally released back into the wild when they were ready. I’ve read DeKok’s adult fiction, but this is the first children’s book of hers I’ve had the pleasure of reading. Just like some of her adult fiction, Raccoon Tales is based upon events from the author’s life. In this delightful story, children learn all about raccoons, and how, in many ways, they are like children, each having their own personalities and likes or dislikes. As the story of these raccoons unfolds, DeKok is able to let her readers know that God is always with them, just like He is with these little creatures that He created. The book talks briefly about God’s love, prayer, and doing what is right. In an easy and fun way, children are taught these lessons without even realizing it. The illustrations by Leslie Helen Colwin are darling. She captured the essence of Chatter, Lucy, Shadow, Meeko, and RC so well. The last page of the book also includes some raccoon facts. There’s so much to enjoy in Raccoon Tales by Joy DeKok. Don’t be surprised if you find your youngster asking to read this one over and again. 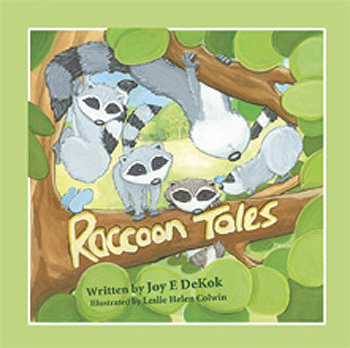 Enter to Win a Copy of Raccoon Tales by Joy Dekok! Now that you’ve read how great this book is, don’t you want to own a copy for your child, grandchild or other special kid in your life? 1) Leave a comment here with a working email address so that we can contact you if you win. 2) Tweet about this contest for an extra entry. Leave us the link to your tweet. 3) Announce this contest on Facebook for two additional entries. Show us you did. 4) Blog about this contest for three additional entries. Make sure you leave us a link to where you blogged about it. This contest will run from today until 11:59 PM (Eastern) on March 26th. We’ll announce a winner by the first week of April.